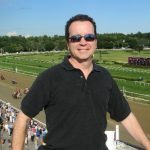 The Great Horse Racing Video Series at Agameofskill.com showcases great horse races in history. Feel free to post some of your favorite videos in the comment section and we may just feature that race(s) in a future post. This is horse racing fan Kevin Phillips’ favorite, the incredible stretch run of the 1987 Breeders’ Cup Classic at the old Hollywood Park.